Serena Williams at the French Open 2016 at Roland Garros in Paris. The US's Serena Williams reacts after winning her women's fourth round match against Ukraine's Elina Svitolina at the Roland Garros 2016 French Tennis Open in Paris on June 1, 2016. The US's Serena Williams signs autographs after winning her women's fourth round match against Ukraine's Elina Svitolina at the Roland Garros 2016 French Tennis Open in Paris on June 1, 2016. The US's Serena Williams (R) speaks to Ukraine's Elina Svitolina after winning their women's fourth round match at the Roland Garros 2016 French Tennis Open in Paris on June 1, 2016. The US's Serena Williams returns the ball to Ukraine's Elina Svitolina during their women's fourth round match at the Roland Garros 2016 French Tennis Open in Paris on June 1, 2016. The US's Serena Williams reacts during her women's fourth round match against Ukraine's Elina Svitolina at the Roland Garros 2016 French Tennis Open in Paris on June 1, 2016. The US's Serena Williams serves the ball to Ukraine's Elina Svitolina during their women's fourth round match at the Roland Garros 2016 French Tennis Open in Paris on June 1, 2016. US player Serena Williams returns the ball to France's Kristina Mladenovic during their women's third round match at the Roland Garros 2016 French Tennis Open in Paris on May 28, 2016. 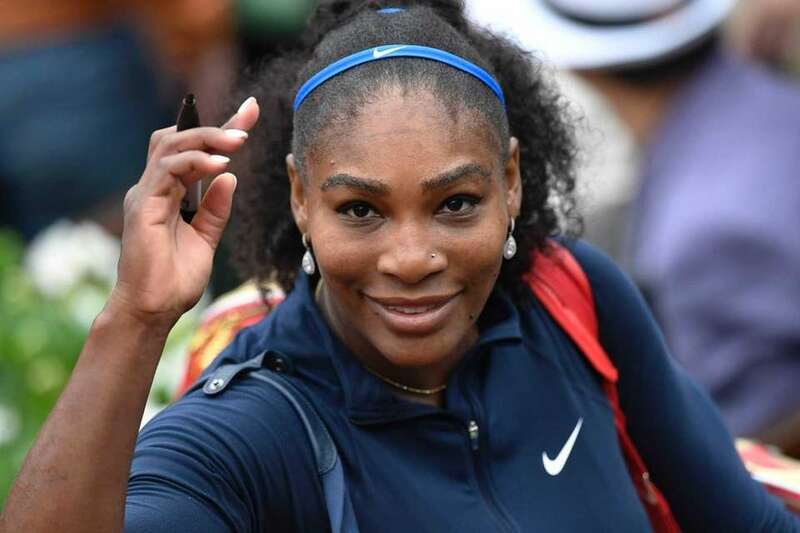 US player Serena Williams celebrates after winning a point against France's Kristina Mladenovic during their women's third round match at the Roland Garros 2016 French Tennis Open in Paris on May 28, 2016. US player Serena Williams reacts during her women's third round match against France's Kristina Mladenovic at the Roland Garros 2016 French Tennis Open in Paris on May 28, 2016. US players Serena Williams (2nd R) and Venus Williams (R) rest during their women's first round double match against Latvia's Jelena Ostapenko and Kazakhstan's Yulia Putintseva at the Roland Garros 2016 French Tennis Open in Paris on May 25, 2016. Ladies Singles Champion Serena Williams of the United States receives her award during the 2016 ITF World Champions Dinner on day ten of the 2016 French Open at the Pavillon Cambon Capucines on May 31, 2016 in Paris, France. Serena Williams of the United States and Venus Williams of the United States talk tactics during the Ladies Singles fourth round match against Kki Bertens of Netherlands and Johanna Larsson of Sweden on day eight of the 2016 French Open at Roland Garros on May 29, 2016 in Paris, France. Serena Williams of the United States walks out onto court during the Ladies Singles third round match against Kristina Mladenovic of France on day seven of the 2016 French Open at Roland Garros on May 28, 2016 in Paris, France.